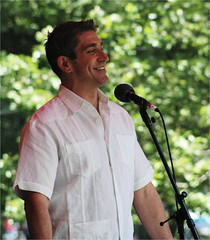 Ah, if it were only true that Richard Blanco was joining us at Poetry Under the Paintings, but alas! Such is not to be. But then again, maybe if we asked him. . . Hey, you never know. Anyway, I know that most of my readers here are not members of my local community, but from time to time I like to let you know what’s going on here in the valleys of central Pennsylvania. The second Thursday of each month a small group of poets and poetry lovers meet at Faustina’s Gallery in Lewisburg for Poetry Under the Paintings. It’s a lovely atmosphere to share a love for the spoken word, and sometimes we have the accompaniment of bongo drums with the legendary Steve Mitchell, or the keyboard magic of my beautiful and talented boyfriend Brian Kelly. We’ve even been graced with the acoustic guitar sounds of Dave Miller of the Dave Miller Band. Usually we have some of Ann’s mint tea or some hot coffee nearby, depending on the time of year. Painters, visual artists, school teachers, librarians and students all come to either read poems, or listen. As I said, it’s often a small group, but we’ve had as many as forty people gathered in the gallery at least once, when the local high school brought their Poetry Out Loud group in. It’s not formal; you don’t sign up to read; you just stand up when someone sits down. You can read a poem you wrote or an old favorite, give us your rendition of a classic or introduce us to something new. It’s open and up to you. We usually ask that you bring a chair if you have one because seating is limited in the art gallery, but we’ll squeeze you in somehow. 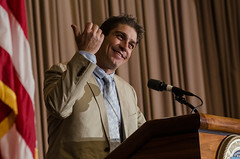 The reason I brought up Richard Blanco is that this month we have bumped back the PUP gathering to the third Thursday so that folks from our group can carpool an hour away to Penn State University to hear the inaugural poet read his work. Click right here to read about the event, and if you’d like to read a bit of his work and hear it in his voice, you can find my posts about him from back in January right here. Click here for more, along with a brief history of U.S. Inaugural readings, and find my review of his inaugural reading here. So I’m looking forward to seeing Blanco in State College, and if you are ever in the area, please stop by Faustina’s Gallery in Lewisburg and tell Jody I sent you. If you are nearby next week on Thursday the 17th, come by and enjoy an evening of poetry and art. We’ll be back to our second Thursday schedule in November. Here is a tiny sample from our May gathering. You can find more PUP tidbits here on the Dad Poet by searching for the tag Poetry Under the Paintings in the search bar, or via the link here. The poems are of spring, but with the weather we are having here this week, nobody knows it’s October anyway. A nice custom in your community. I’ve enjoyed more than a few of Mr. Blanco’s poems since he crossed my radar as the inaugural poet. Hope you and yours are all well, David. Thank you, JD! And to you also. I hope you enjoy your evening listening to Mr Blanco … and, we’ll expect a gushing post afterwards, with all the details. Thanks, John! I’ll be sure to give you all the Juicy details. Like John, I’ll be awaiting to hear your comments regarding the Mr. Blanco reading…take good care. Your title here intrigued me. I came here from your “found Poetry” post to discover what “poetry under paintings” might mean. Not at all what I thought. But I like the idea of having poetry readings in an art gallery. I’ll have to explore this with the art association I belong to. What I originally thought it might mean that intrigues me, was the image of a poem underneath a painting showing through. I may have to play with that idea, weaving poetry and painting together. Oooh! What a cool concept. The poem text actually bleeding through from under a painting? I love it.